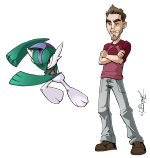 August 01, 2011 / Steve Black Jr.
Hello everybody and Happy Anniversary from @aaronspriggs and everyone else here at PKMNcast.com! It’s been a pretty baller year. From being the first guest host to writing articles on the site, it’s been an honor to be here almost as long as Steve has been. First I want to give mad props to Steve for starting such an awesome podcast and site, and say thank you for sticking to it for so long now. We’ve gotten much better at this whole podcasting thing, lol, and hopefully the next year will be a little easier. I also want to give a major shout out to the @whimsytackle crew for being so awesome and for teaching me again how to play the TCG. My horribly stereotypical and overused RehsiBoar deck is getting better, and I’m starting to think about other decks I could be building with what I have so far. Our two newest editors are a part of this group, and are going to be an amazing addition to the site/podcast. Welcome Vinnie and Kidd! Being able to be a part of the major PKMNcast showings have been amazing. Everything from Midwest Gaming Classic with having an entire tournament room to ourselves, to having live panels at Anime Milwaukee, and the massive C2E2 in Chicago, and recently being able to attend VGC’s in Indianapolis this past month, it’s been quite the ride. Hopefully we get to attend even more awesome events this next year, and maybe even hit 1000 facebook fans? Not only do I think the listener base will be that big, but I think we could even hit 2000 by the two year anniversary. Not so lofty of a goal now I don’t think. Especially coming from my first apperance recording episode 3 in Steve’s den thinking, “Is anybody going to even listen to this?”, to us hitting nearly 700 fans on facebook now. Wow. I hope to be on many more episodes of It’s Super Effective, Critical Hit, and maybe even some episodes of Leftovers in the future!